Having run a fantastic season, Dance+ season 4 is coming to an end this weekend. The dance reality show is one of the most watched programs in India and among the Indian communities living outside India. The show is aired every weekend on Star Plus and is highly popular among the audience of all the age groups. Dance+4 is hosted by Raghav Juyal and Sugandha Mishra and is judged by Bollywood Top Choreographer Remo D’Souza. A total of 12 contestants are selected and divided into three teams which are captained by Dharmesh Yelande, Shakti Mohan, and Punit Pathak. Out of the selected 12+1, four contestants make it to the final and one emerges as the winner. Dance + season 4’s finalists are Vartika Jhaaa, V Unbeatable, Sujan and Aaanchel, and Chetan Salunkhe. All the four contestants have earned millions of audiences in and out of India after a series of fantastical performances. And the final episode will see their best yet performance up until now. One can say that the finale will be one of the toughest for all the contestants as there will be a head-on battle between them. Over the course, the show saw the presence of many top-rated actors and actresses from Bollywood like Shilpa Shetty, Govinda, Sara Ali Khan, Shah Rukh Khan, Anushka Sharma, Katrina Kaif, etc. as Special Guests. The Grand Finale Episode of the show will have Prabhu Deva as the special guest and will grace the audience with performances from Actresses Mouni Roy and Nora Fatehi. 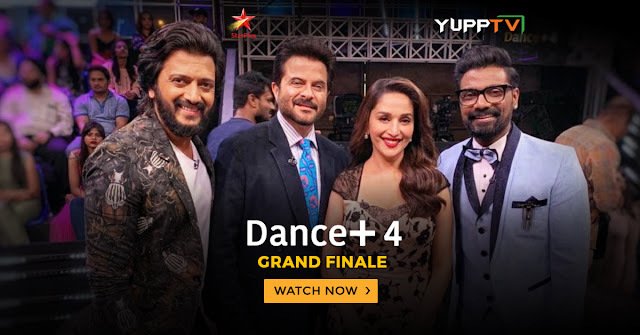 The Grand Finale episode of Dance +4 will be aired on Star Plus Live this Saturday at 08:00 PM IST. Audience from all over the world can watch it on YuppTV App or website from their Smartphones, Smart Televisions, and other internet-enabled devices.